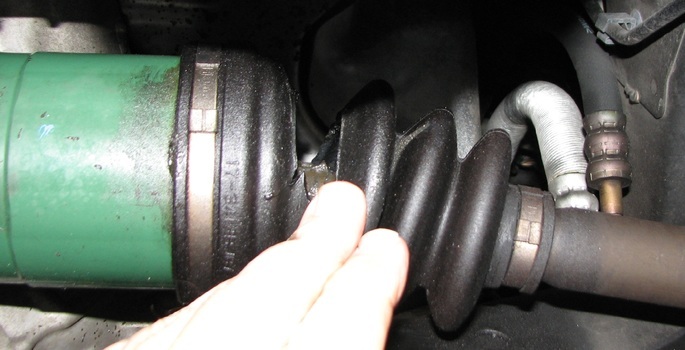 This article will cover the replacement of a torn Constant Velocity (CV) boot on the Subaru. You might ask, "why not just replace the whole axle?" Well, if you catch the problem early enough, there's a good chance there's nothing wrong with your original axle. In this case, the tell-tale sign was a little bluish smoke and a nasty burning smell at the front of the car at a stop or following a highway drive. As it happens, my tear was on the passenger side interior boot, which is situated very close to several heat shields. So not long after the boot opened up, so did the smoke and smell from the burning grease. If you're fortunate enough to catch it early, and your not experiencing any clicking or wheel hop during slow-speed turning, chances are good that your axle does not need replacing. 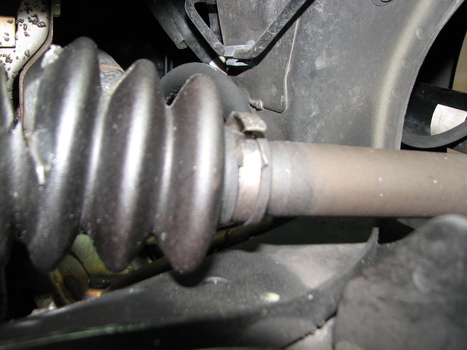 Replacing just the torn boot will save you a considerable amount of money (boot kits are cheap - only about $15), and you may also feel better about hanging on to your OEM CV axle over the ambiguous build quality of some re-manufactured units. A hydraulic jack and jack stands to safely raise the car off the ground. Large breaker bar (or power impact wrench) for the strut bolts. Plenty of rags and/or paper towels - This is going to get messy! A helper to move the wheel hub assembly while your under the car. A CV Boot Kit. Generally available from your local auto parts store, although not necessarily in stock. Best to call ahead and order one, as necessary. I used a kit from AutoZone, part #1032593, that cost about $12 The kits generally include a new boot (an inner or an outer, but not both), two new band clamps, and grease. My kit also included a new snap ring for the bearing assembly, which was a welcome addition since I got the original ring a bit twisty after removal. There are 3 different boots used on the car. Raise and secure the car for working underneath. 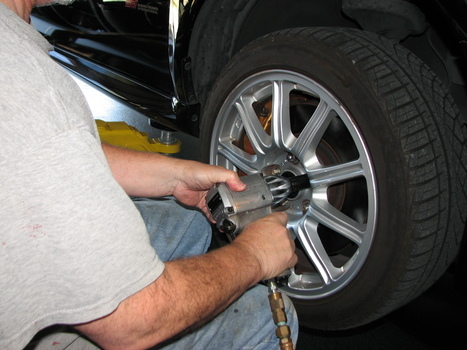 Using an air impact wrench or (muscle-powered) lug wrench, remove the wheel. Gain Access to the CV Axle. 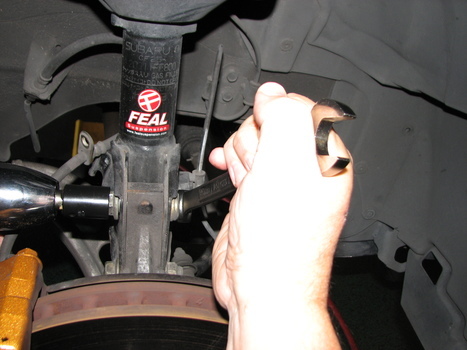 Removing the axle nut and steering rod has a small risk of tearing the bushing on the steering rod linkage. 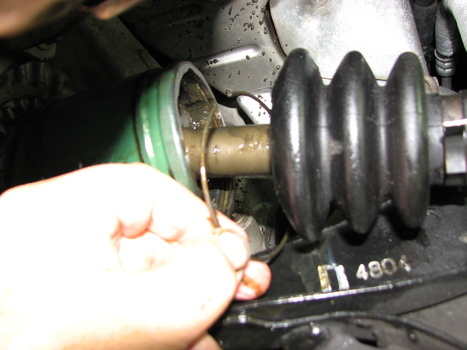 Removing the strut bolts is easy; but aligning the strut for reassembly can be frustrating. I've included a few tips to help this go more smoothly. To make more room to flex the rotor assembly, we'll remove both the brake and ABS cable brackets attached to the strut. These are both 12mm bolts, one to each side. Remove the bolts and separate the brackets from the strut. Before disassembly, it's important to note the position of the top bolt, which is used to set the tire camber. 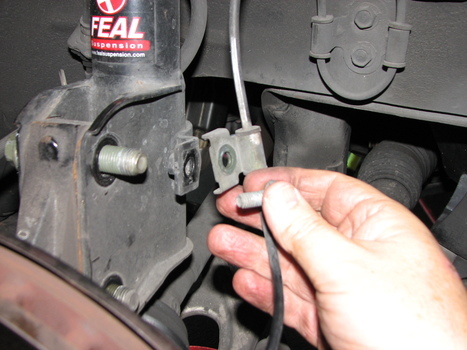 Wipe off the bolt and surrounding area, and you'll see some alignment marks. Using a permanent marker or paint, mark the bolt head and adjacent area in order to align the bolt the same way when you put it back. 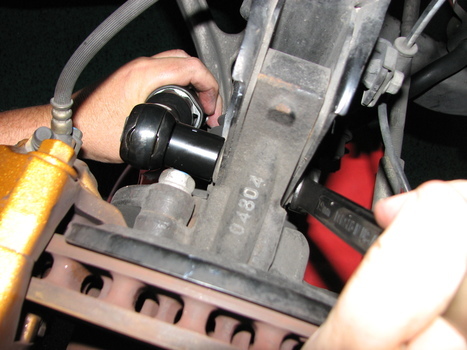 With the top camber bolt marked for proper alignment, remove it using an impact wrench or breaker bar. 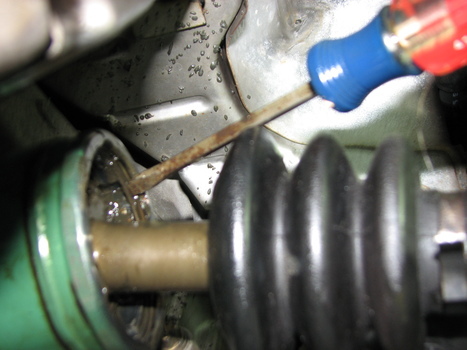 Use the same method to loosen (do not remove) the lower strut bolt. Once it's loose, the top of the hub assembly may slip forward a bit. Leaving the bottom bolt in place for now will prevent it from flopping around excessively. Now it's time to slide under the car and get after that CV Boot. Using a flat head screwdriver, pry open the retaining clips on the inner and outer boot clamps, loosen, and pull back out of the way. With the clamps now loose, slip them over the boot and out of the way. 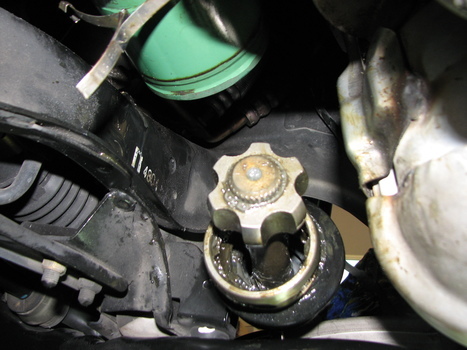 Pull the boot back and off the green axle "cup" attached to the front differential. 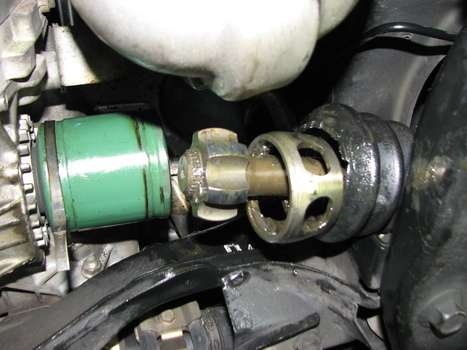 Take a rag and wipe away some of the grease inside the green cup in order to locate the retaining ring. 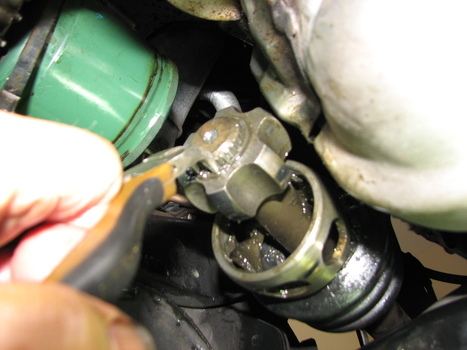 Use a flat head screwdriver to pry the retaining ring out. The ring is a semi-circular wire which sits in a groove just inside the cup. It is simply tension-mounted, so just work the screwdriver blade underneath it and pop it out. Tip: You can rotate the axle to locate the open end of the retaining ring, which may make it a little easier to slide the screwdriver under. Also note that I cut away part of the old boot for easier access. With the retaining ring removed, the CV Axle bearing assembly can now be pulled out from the green cup. Several preparatory steps are advised before you pull the assembly out. First, lay out a clean towel or t-shirt underneath the cup area to catch the ball bearings. Oh yes, you WILL drop the ball bearings (don't say I didn't warn you when they roll down the driveway!). Second, if you have a helper, ask them to stand at the wheel hub and pull it about to withdraw the axle, as you play "catcher" from underneath. 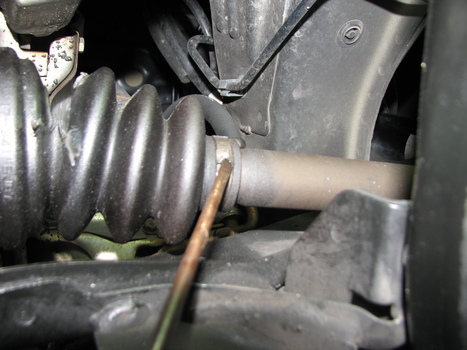 This may require that the lower strut bolt be completely removed to gain enough clearance to remove the bearing assembly. 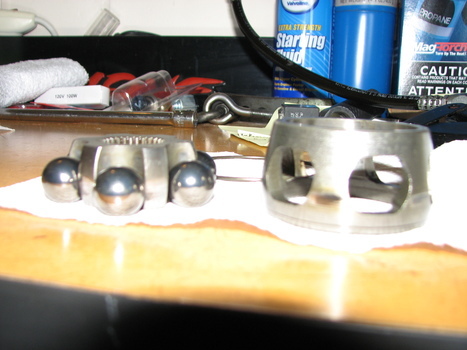 This picture shows the bearing assembly, minus the six ball bearings (just about all of them fell out). Wipe the grease from the end of the Bearing Assembly so you can see the slip ring. Using slip ring pliers, spread the ring open and remove. If you don't have a new replacement in your CV Boot Kit, treat the existing one with care for re-use (probably not recommended). With the slip ring off, the Bearing Assembly simply slides off the splines at the end of the axle. Note that I distorted the original taking it off - best to buy a kit that includes a new ring for this reason. 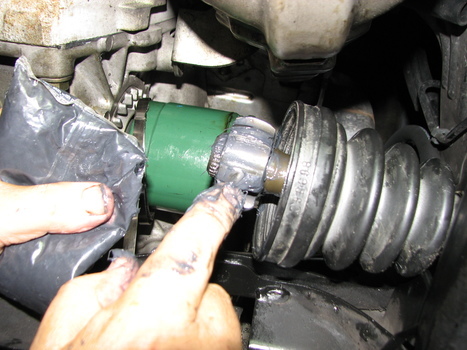 Remove the old boot and using some clean rags or paper towels, remove all the old grease from inside the green cup, the axle, and the bearing assembly. Don't mix the old grease with the new, you want all fresh grease in there. A few more images of the bearing assembly, now re-united with the balls! 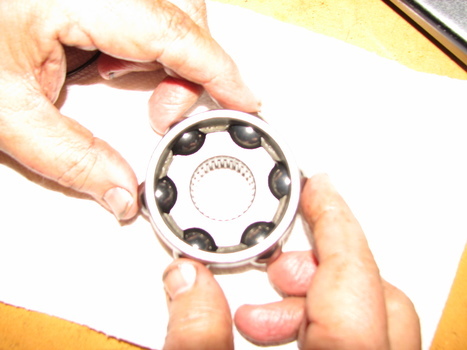 This illustrates the finger-balancing act necessary to keep the ball bearings in place once you're ready for reassembly. Bonus: Your hands will be all greasy/slippery, and so you may get flashbacks of chasing the greased pig at the County Fair at this point. Ok, let's get the new stuff on there and get this car rolling again. Slip on the two new clamps and move them to the left (over the green cup) and right (over the axle), out of the way. Slip on the new boot and fasten the smaller outer clamp over the new boot. There's a special tool for this but you can do it with needle nose pliers and applying downward pressure to the clamp to keep it from spinning round. Once the clamp is taut and folded over, bend the 'dog ears' down to hold it in place. You may want to cut off excess clamp band with snipping shears, as needed. Now slip on the bearing case and bearing assembly. NOTE: Be sure to orient the bearing case properly, it is NOT front-to-back symmetrical and it will go inside the green cup backwards!! The larger, flat side must go in the green cup first, with the tapered side facing outward. 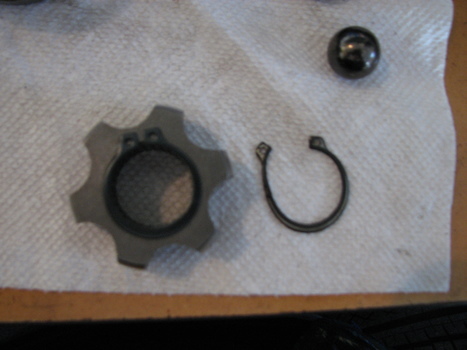 Secure the bearing assembly by inserting the new (or re-used) snap ring in place. Tug on the bearing assembly to test that the snap ring is securely in place. Be sure to get the ball bearings, bearing assembly races, and just about everything else loaded up with the new grease for reassembly. Line the inside of the green cup with any remaining grease. 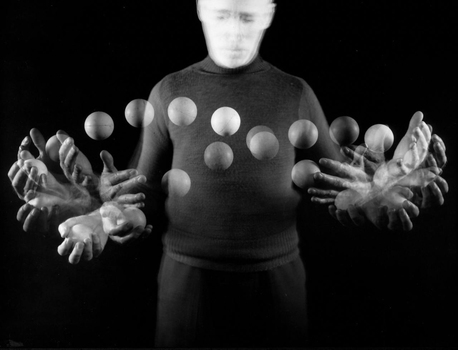 So since I only have 2 hands I didn't get any pictures of me actually finger-balancing the balls in place. Suffice to say that having a partner available to help push the hub assembly back into the cup while you hold the whole thing together from underneath is, well, pretty much essential. Once you have the bearing assembly inserted inside the green cup, re-install the retaining ring by simply sliding the ring opening over the axle and then snapping it into place within the inside groove of the cup. Note: Your partner will need to press the axle in a bit so you can gain access to the groove area. Once the ring is in place, have your partner pull back on the hub to make sure the ring is in properly and retaining the bearing assembly. Slip the new boot in place over the green cup, then slide the larger boot clamp (which you left draped over the green cup, right?) in place and tighten. Wipe up any excess grease - your done with the undercar work. Re-install the 19mm bolts to the strut. The hub assembly may not want to align properly - In my case the strut needed to be raised up (against its will). Here's what I did: Work to get the upper (camber) bolt in first. Carefully use a pry bar in between the bottom surface of the strut and the top of the outer green cup. NOTE: Be careful not to slip off the cup, as the outer boot could get torn (Nooo!). In addition to the pry bar, I used a large screwdriver in the bottom bolt hole to get the alignment just right in order to get the camber bolt in. Once the upper camber bolt is in, remove the screwdriver from the lower bolt holes and use the pry bar alone to get the lower bolt in place. 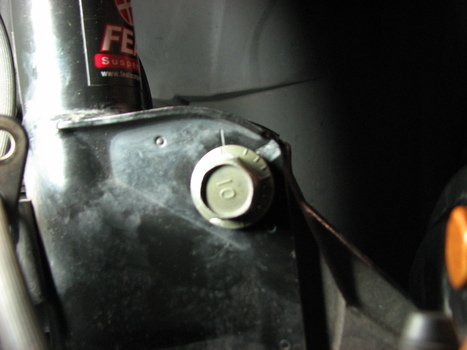 Also remember to align the upper camber bolt to the original markings before tightening it down. 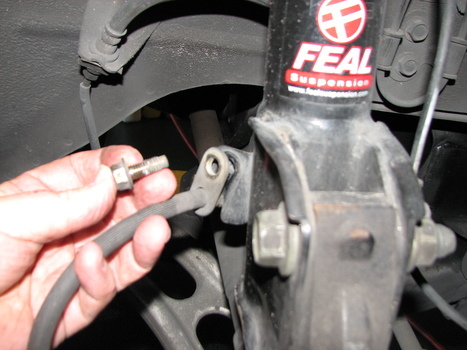 Re-attach the brake and ABS brackets with the 12mm bolts. Mount the wheel in place - the fact factory alloy wheel lugs get torqued to 72 ft/lbs.